9.2 / 10 based on 16 reviews. Of the 16 people who reviewed this product 100% would recommend it. Order process was easy and delivery quick with good scheduling information. Fitting kit and installation instructions easy to follow. Free shooting magazine a welcome bonus! very good - we are using it for controlled storage of development samples and it is just the correct size. Only problem another Key works well, does the job. Ideal for full bore ammo storage. I could no longer fit it all in the small box at the top of my gun cabinet. Fitted exactly in the space next to the cabinet in the roof space. Ideally it would be better if the door opened from the other side but I wanted it quickly and it really isn't a problem as door opens widely. Easy to lock and it was easy to install securely. I could have done it myself but managed to get my brother to do it for me. 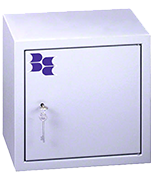 Now have space to securely store important documents as well. Great product, suits my needs perfectly. Great price, with enough solid engineering to delay any attacker for long enough to ruin their chances of getting your gear. very easy to install with solid bolts. Very good value for money. Domestic UK approval. EN 14450 "Euro" classification would be an asset overseas. Lock is set rather deep, requires a little bit of alignment. Not actually a Con, but merely an observation. The product does exactly what it's designed for. My second Brattonsound safe. I bought my first safe when I lived in Suffolk. I needed another one and bought one without hesitation because I knew the build and quality was excellent. Here in Cornwall, the local law insist an alarm is fitted. Due to the ultra strong construction, easier said than done. Maybe an idea to have one built in as an option......?? You need to be aware of changing the safe to left hand opening model! You of course will pay extra for the privilege but need to know that you will be required to put the key in upside down and turn it in to open and turn out to lock! Make what you like of the over engineering or lack of! Otherwise it does the job it is meant to do!